In this video we will discuss how to capture deadlock graph using SQL profiler. 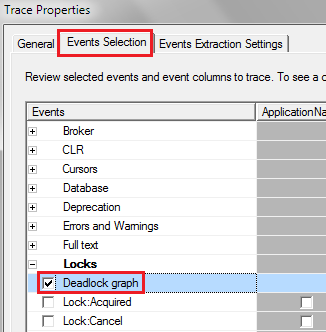 To capture deadlock graph, all you need to do is add Deadlock graph event to the trace in SQL profiler. 7. The deadlock graph should be captured in the profiler as shown below. The deadlock graph data is captured in XML format. If you want to extract this XML data to a physical file for later analysis, you can do so by following the steps below. 1. 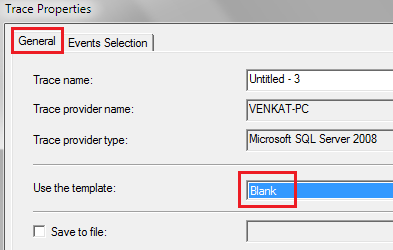 In SQL profiler, click on "File - Export - Extract SQL Server Events - Extract Deadlock Events"
The deadlock information in the XML file is similar to what we have captured using the trace flag 1222. 1. The oval on the graph, with the blue cross, represents the transaction that was chosen as the deadlock victim by SQL Server. 2. The oval on the graph represents the transaction that completed successfully. 3. When you move the mouse pointer over the oval, you can see the SQL code that was running that caused the deadlock. Server Process Id : If you are using SQL Server Management Studio you can see the server process id on information bar at the bottom. Deadlock Priority : If you have not set DEADLOCK PRIORITY explicitly using SET DEADLOCK PRIORITY statement, then both the processes should have the same default deadlock priority NORMAL (0). Log Used : The transaction log space used. If a transaction has used a lot of log space then the cost to roll it back is also more. So the transaction that has used the least log space is killed and rolled back. 5. The rectangles represent the resource nodes. HoBt ID : Heap Or Binary Tree ID. 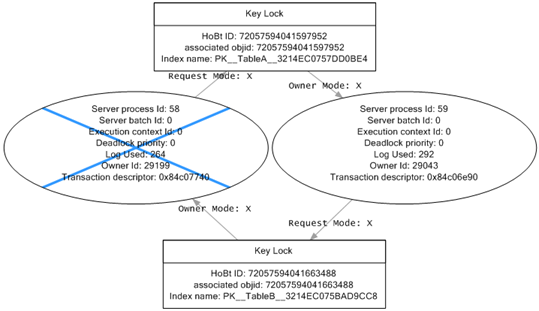 Using this ID query sys.partitions view to find the database objects involved in the deadlock. 6. The arrows represent types of locks each process has on each resource node.